Are influencers worth the “free” product or service? What about the fees they charge for advertising on their social accounts? Despite some of the world’s biggest brands diverting the majority of their budget to influencer management over 2017 and likely to continue growing in 2018, the worth of these campaigns have been questioned by many. Social media influencers are essentially what allow brands to build a relationship with consumers on social media platforms. Influencers not only drive audiences to your page by advertising to their following, they also create word-of-mouth communication of your brand in comparison to direct advertising. 70% of Youtube subscribers trust influencer opinions over traditional celebrities and 86% of women turn to social networks before making a purchase decisions. 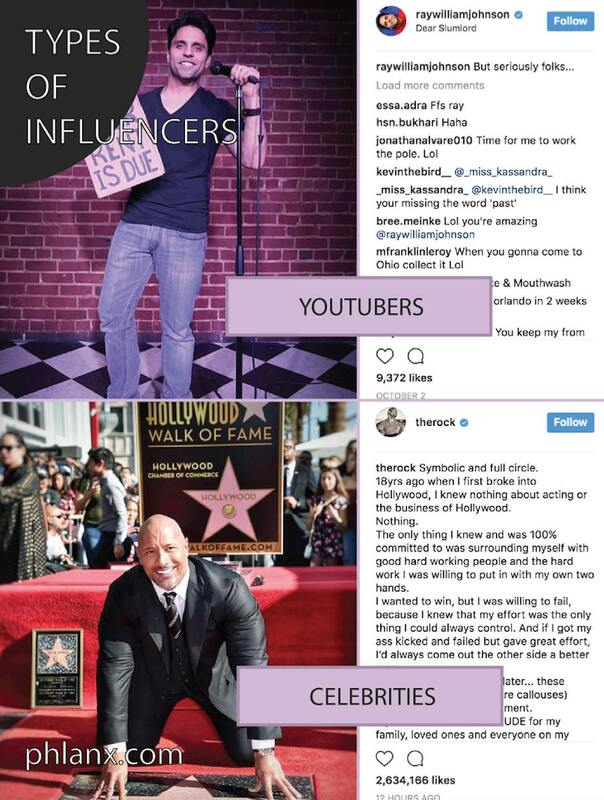 Phlanx has hyperlinked an example of each influencer niche above to preview the kind of content that Instagram specific influencers create. Influencer targeting becomes effective by researching and working with a person that the audience will believe – authenticity is key and finding the right alignment is arguably the trickiest part of social media targeting. Types of influencers include celebrities, bloggers, social media experts and popular Youtubers. Research has proven that brands indeed trust influencers, backed by a Nielsen Study which showed that 90% of Instagram users put their faith in peer recommendations. How to ensure influencers are worth it?! 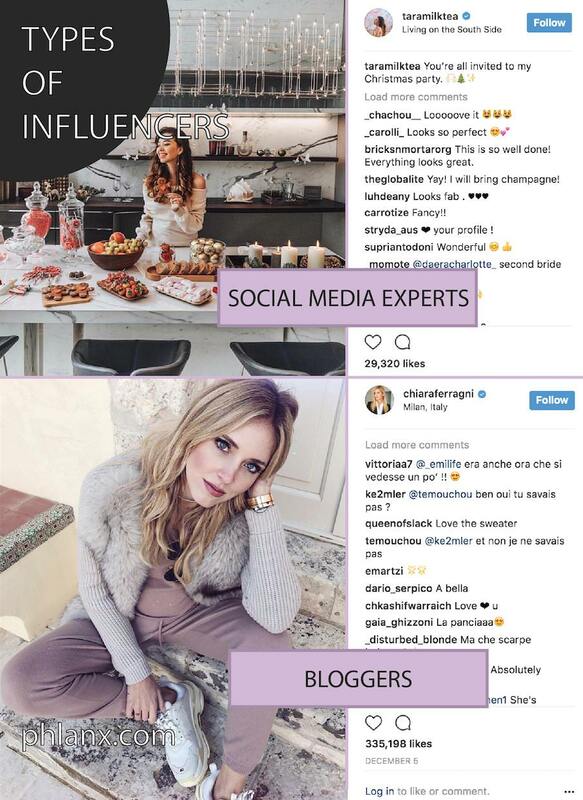 Well known beauty influencer Chloe Morello recently made headlines in calling out fake social media profiles in a Youtube video and this is one of the key pointsbefore you make any decisions regarding which influencers to work with – do your research and ensure that their following is authentic and their engagement is legitimate. Here are a few tips below! Micro-Influencers have less of a following than larger social media influencers, yet are good to work with as they are engaging and “believable”. To be a micro-influencer you generally need good content with purpose, as well as a following between 3,000-15,000 followers. Followers trust them and their recommendations provide a good source of word of mouth. Their Instagram, blogs and overall social media accounts need to have an endearing aesthetic and a fanbase that is engaging. Are people being influenced by their posts? For brands that don’t have a macro budget, using micro-influencers works a charm and there’s definitely room for every type of brand budget. Search influencers who are gaining traction. On the Phlanx.com platform we have a directory of thousands of influencers, however choosing the right ones to approach can be tricky. Perhaps a particular influencer has been generating attention in the media or their post/blogs have reached other audiences in addition to Instagram. Life moves faster than it used to and brands are now using a multi-disciplinary approach to marketing on Instagram, Twitter, Pinterest and a myriad of other platforms that aid in their growth. Move quickly with influencers who keep up with this rhythm and are posting relevant content and brands. 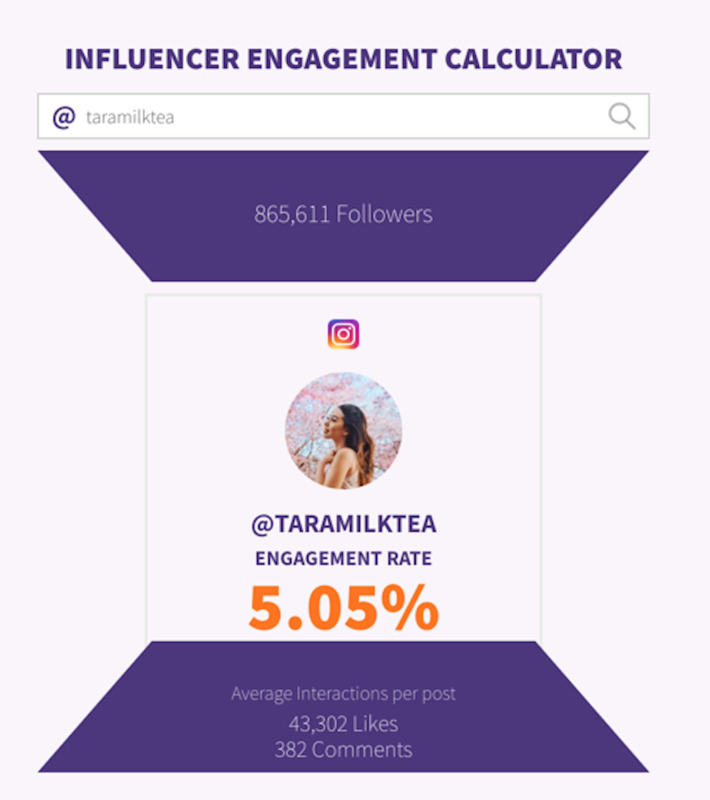 Tara Milk Tea is an excellent example of an engaging Influencer who works quickly and remains relevant. Ahead of Christmas Tara has posted a beautiful photograph, an engaging caption and one that leveraged on the Christmas sentiment. Tara’s post received 33, 765 likes a well as highly engaged comments. 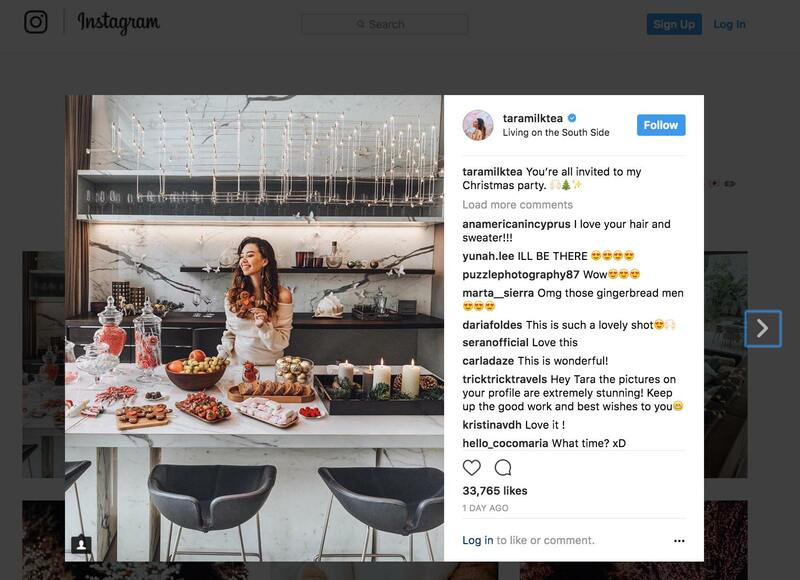 Not only will other brands repost Tara’s photograph as a form of their own content creation, however she has ensured she remained relevant and provided holiday inspiration for her following. What brands have they worked with and how are those brands tracking? If you have the patience and the time, keep track of collaborations between influencers and businesses. It’ll allow you to see if their audiences were interested or engaged in similar products or services to you. Not all influencers will be comfortable sharing their analytics, however there are many who would and thus politely asking for an “example” of analytics is a great way to gauge if a social media influencer is the right fit for you. Alternatively, there are also some fantastic tools that can help you decipher if a specific influencer is the right one for your brand including the Phlanx Engagement Calculator. 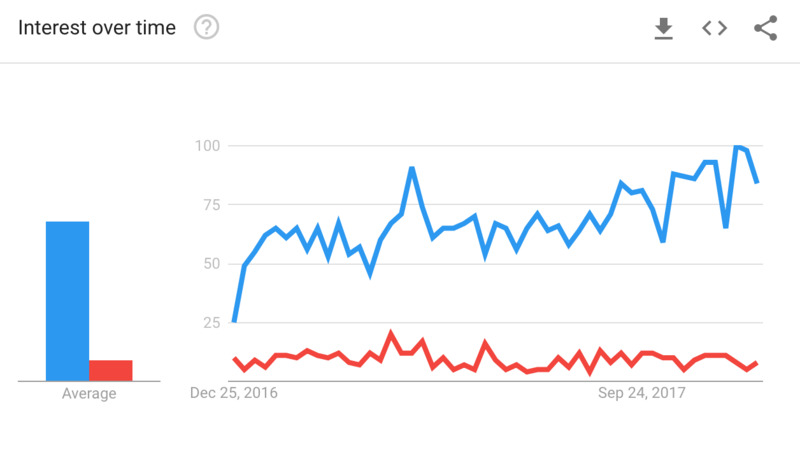 Google Trends has shown a drop of print advertising and a growth of influencer marketing over the last 12 months (2017). The use of influencers has become a staple amongst many of the world’s biggest brands and thus a form of digital marketing that shouldn’t be ignored. In the opinion of Phlanx.com – most definitely worth the search! 1) How to find the right influencers for your brand?